(NewsUSA) - A foursome of four-wheel drive clubs are the winners of the 2016 Outstanding Trails Program sponsored by BFGoodrich Tires, in partnership with 4 Wheel Parts, United Four Wheel Drive Associations, Blue Ribbon Coalition, and Off Road Business Association. The Outstanding Trails program, now in its 11th year, was created to promote trail conservation and responsible off-road driving. The program invites off-road clubs from all over North America to nominate local trails that need maintenance or improvement. A panel of judges chooses the winning clubs and trails, which are selected based on unique features, terrain, and club support. The four off-road clubs chosen each year receive grants of $4,000 each to use for local efforts to preserve and protect their hometown trails. In addition, representatives from BFGoodrich Tires will attend club events related to the winning trails in order to highlight each location's unique features and educate four-wheel drive fans in responsible trail use. "The saying goes, 'where the rubber meets the road,' and at BFGoodrich, not only do we take that to heart, but we also believe that where the rubber meets the trail is equally important, and that starts with the All-Terrain T/A KO2 tire," says BFGoodrich's Oscar Pereda. "In our first ten years of the Outstanding Trails program, we have helped to improve, repair, maintain, and protect nearly 50 trails in 17 states and two Canadian provinces." Each of the winning clubs has plans to improve and maintain their local trails. One in particular has taken conservation a step beyond the trail itself to include animals that live there. The Grand Mesa Jeep Club "has adopted the 21 Road Trail and other local trails and is committed to its protection and maintenance," according to club president Jeff Bates. But the club has adopted not only the road, but also the Great Basin Spadefoot Toad (also known as the "21 Road Toad"), a threatened species in the area. "The club has committed to protecting the toad's habitat in at least three areas along the trail with posts and cable," Bates says. 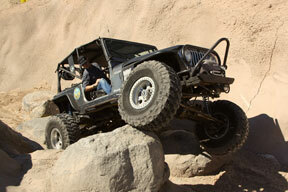 Visit bfgoodrichtires.com for more information.